For migrants and refugees crossing the Mediterranean trying to reach Europe, 2015 was the deadliest year on record, according to the International Organization for Migration. A total of 3,771 people are estimated to have died while making the perilous voyage, compared to 3,270 in 2014, the Geneva-based organization said in a statement Thursday. 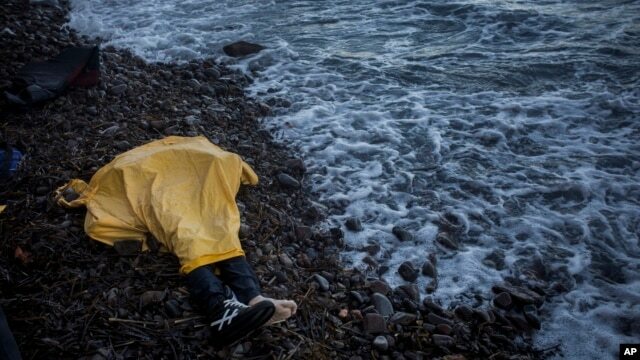 Around the world, more than 5,350 migrants died in 2015, it estimated. At least 800 died in Southeast Asia, mostly in the Bay of Bengal, the Andaman Sea, Malaysia and Thailand. At least 330 deaths were reported on the Mexican side of the U.S.-Mexico border. But the bulk of deaths occurred during attempts to cross the Mediterranean Sea bound for Europe. The deadliest month came in April, when close to 1,250 migrants died ? 800 of them when their overcrowded ship capsized off the coast of Libya. "It is shocking and inexcusable that desperate migrants and refugees have lost their lives in record numbers this year, when they should not," said the organization?s director general, William Lacy Swing, said in a statement. "The international community world must act now to stop this trend against desperate migrants." "We have been reminded that much of human mobility is not voluntary," Swing said, "and, tragically, we have seen so many who felt they had no option but to leave their beloved homelands and were lost at sea, in the deserts or trapped in the back of lorries they had hoped would carry them to a safer and better life." He urged the international community to change the "toxic narrative of migration to one that is historically accurate, namely, that migration has been overwhelmingly positive. We can do this through measures that will help governments and societies manage diversity."